I used to google it every time. But here’s the ultimate answer! Foolproof corn on the cob every time. I originally added this to my blog as a reminder for MYSELF, but apparently I’m not the only one who forgets how to boil corn on the cob. I’m glad you found your way here! Save this post so you don’t lose it. BTW This post includes affiliate links. If there’s one thing that says “summer” to me, it might just be corn on the cob. When my family visited my grandmother in Michigan every summer, “Doo-Dah” would bring us corn on the cob for the requisite family cookout. My dozens of cousins and second cousins (well, close to dozens) and I sat in the yard, shucking the corn and taking off as much of the silk as we could, happily anticipating the feast ahead. A few short hours later would find us happily munching the kernels off of the cobs, which we had buttered and sprinkled with salt. Delightful! My father taught me how to eat the corn neatly so it wouldn’t get stuck in your teeth, by popping the kernels off one row at a time using your bottom teeth, rather than digging in with a CHOMP! It works, and has the added benefit of a typewriter joke. Finish the line of corn, say “Ding!” and start over. Well, that’s what my dad does anyway. He also taught me the delights of eating leftover corn, still cold from the fridge, with a sprinkle of salt. It’s one of my favorite summertime treats to eat corn this way, so I usually get extras so I can intentionally have leftovers. Unfortunately, when I moved out on my own, I discovered that I wasn’t actually sure about how long to boil corn on the cob. Or the best way to cook it at all. I tried microwaving it, boiling it endlessly, seasoning the water with a variety of things… but nothing was ever quite right. So after reading about a dozen “recipes” and formulas for corn on the cob, the guy and I settled on this method (which is a conglomeration of a couple different ones), which turned out to be a happy discovery. So here it is… the “recipe” – and the secret of how long to boil corn on the cob. How to Boil Corn on the Cob Perfectly - Too Easy for a Recipe! Bring everything to a boil, making sure the sugar is dissolved in the water. Boil for no longer than 8 minutes. Remove from the water and let it cool enough for handling and eating. Handle it and eat it. Well, almost perfect. It was early-season corn and not the best I’ve ever had, but it was delicious and cooked properly! With just a smear of butter and a few shakes of salt, it was delicious with our dinner of tomato pie. And I had my 2 ears of leftover corn reserved in the fridge for later, when I enjoyed them cold, and sprinkled with salt. 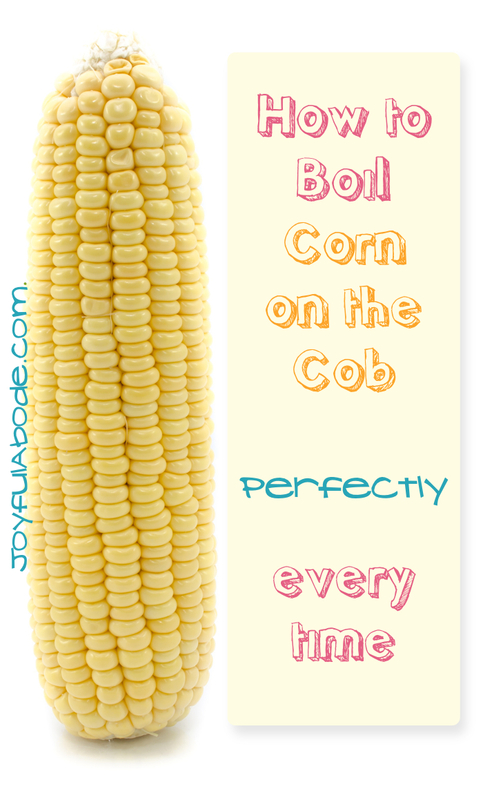 Now that you’ve got such an easy delicious recipe for how long to boil corn on the cob, don’t forget it! *Unless it’s grilled, which is equally as delicious, and always a special treat. I LOVE grilled corn on the cob. If you liked this recipe for how to boil corn, make sure to pin it! Thank for sharing! Can i add some other seasonings of my choice or replace the sugar by honey for this recipe? leave out the sugar sweetcorn is already sweet..the clue is in the name!! those corn holders never went away! We boil our ears of corn for three minutes. Delicious! Thank you for the reason of adding salt to bring out the worms. I don’t use salt and the thought of eating wormy corn just made me gag. No corn on the cob for us. The most important thing is to never use salt when cooking corn because it makes corn tough. Salt it right before you eat it. Someone said salt removes worms but the heat from cooking would because they try to escape the heat. This is why canned corn is so tough because they add salt to the can in the canning process, read the ingredients. As hot as corn on the cob gets I would not worry about worms (they are really the grubs from corn earworms) and have never found any in my kettle and they won’t hurt you. All veggies and flour have traces of insects. You can also cut bad spots off the cob before you cook it too. I have soaked my corn over night in sugar water before I’ve cooked it. You could try this to remove any corn earworms and change the water before cooking if that bothers you. You can even add more sugar to cook it if you want. I use a whole cup of sugar but make a big kettle full of corn. I do mine this way almost. But once the water is boul, I turn the heat off and leave the corn in for about 5 minutes. Love all the recipes. I do the salt, sugar 8 minute way but living in San Diego, we are under the Mexican influence and love it with butter and Parmesan cheese. little sprinkle of lime juice and cayenne pepper or hot sauce if you like. I just do the butter and cheese. Especially if corn is grilled.YUM!!!! WOW- I guess here in the Upper Pacific Northwest we are spoiled with Jubilee variety corn and its successor Jubilee Super Sweet- I never ever ever boil the corn longer than 3 minutes tops and never add sugar- just slightly salted water. Slather on the butter and maybe a bit of salt and you’re good to go. The secret is to start with an outstanding variety of sweet corn rather than trying to make up for it in the pot. Of course fresh picked is best. Jubilee makes excellent cream style corn as well and whatever you want- grilled too- very flavorful reliable variety. Just bought corn on the cob yesterday so I will most certainly be using this recipe! 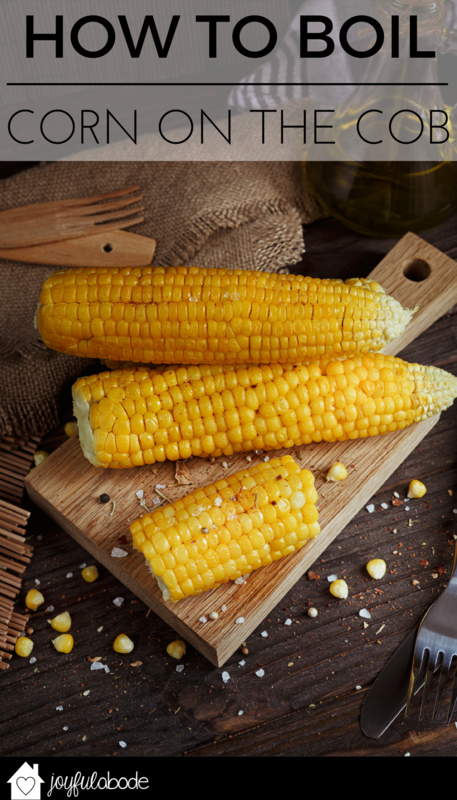 Nothing says summer like corn on the cob! I’m from Iowa, where we never had a bad ear of corn. Lived in NYC for decades and almost never found good corn. Without good corn, it doesn’t matter how long you boil or otherwise prepare it. FINALLY found good white corn from Long Island at Eli’s in Manhattan. Very expensive but worth it. Bring a pot to the boil, add corn and cover. Bring to a second boil. (You have to lift up the cover and peek!) Immediately shut off the flame, let sit TWO MINUTES. Add butter and salt to taste. THIS IS THE LAST WORD! I just tried your method tonight… my family and I loved it! SO perfect and SO easy!!! Thank you!! Should i put the corn in for 8 mins while it comes to a boil? Or let it be already boiling before i drop it in and start the clock? I add salt AND sugar. The salt draws out the worms. No tough corn here either. Followed your easy recipe for Corn on the Cob. It was absolutely awesome!! The corn was sweet, (but not too sweet), crunchy, and enjoyed by everyone. I will use this simple method for years to come! I never eat corn, but we are fasting and only eating fruits & veggies. This was FABULOUS! my super picky daughter (age 5) who doesn’t like veggies (but she eats them anywayz) loved it! Ate her piece and asked for more. Thanks for sharing and don’t worry about haters, they’ll always try to bring you down. grain-free…..you do realize that corn is a GRAIN, right??? I wrote this in may 2008. Over a year before I “found” grain free. Corn is actually a grass, not a grain. a. A small, dry, one-seeded fruit of a cereal grass, having the fruit and the seed walls united: a single grain of wheat; gleaned the grains from the ground one at a time. Also called caryopsis. b. The fruits of cereal grasses especially after having been harvested, considered as a group: The grain was stored in a silo. Who cares smarty pants. Don’t worry about her mistake…. But one mistake she didn’t make was to teach me how darn easy it was to boil some corn.. Lol. Can I say yumm to my first time boiling corn on the cob?! Turned out great. Now I’m not afriad to boil my own corns. Super EASY! No more tiny little store bought freezer corn :)) Thanks, my mommy is going to be surprise! I’m glad you got the point of the post. haha. Haters gon hate. “FRUIT OF a grass . . .” Techically speaking then, your statement is also incorrect. The fruit of a grass is not itself grass, any more than an apple (the fruit of an apple tree) is a tree. Just sayin, you know, since you’re so insistent on accuracy and all. thanks, i never thought it was just that simple. After several failed attemps boiling corn with butter and salt, you have shown me how to do it right. Thank you. BooHoo Mr.No Sugar! Recipe was awesome! Kids loved it…..moderation my dear man. Think we can handle a little extra sugar with dinner. Butter? You better take that out as well. No sugar water and no butter? Yuck! Thanks for the great recipe…. We’ve always added sugar but we add a cup may try it your way with less sugar. Enjoyed reading your site. Tied it today. The corn came out perfect! the sugar added a little sweetness to the corn. Cooked it for 5 minutes. I’m eating this as I type. Absolutely delicious. I boiled for 3 minutes and it came out lovely. In canning recipes Splenda is ok to use but suggested to use half the amount. But, I’ve been useing Stevia or Trivia and with that still use 1/2 the amount called for. So, So, good! I never would’ve thought to add sugar to the water. Loved it! just wanted to comment that you might want to leave out the sugar. The U.S. has a bad obesity problem, ya know? The sugar gives the corn a nice sweet flavor. Who cares if the US has an obesity problem, a half a cup of sugar isn’t going to make a difference to a person that chooses to live unhealthy. Corn has enough natural sugars in it to bring out the sweetness. If your corn isn’t sweet enough then you are boiling it for to long. Came our perfect. I used agava liquid cane sugar which gave it the same sugar taste with less calories and no preservatives. I agree with what was said…if you already have a problem..eating sweet corn is not going to solve it. Live a little! Most of the sugar probably gets thrown out with the water when you drain…then soaking multiple ears of corn decreases this by more. It really was great!..also..i used frozen mini corn and it worked great too! Just wanted to comment you might want to leave your nose out of other peoples’ business. Ya know? 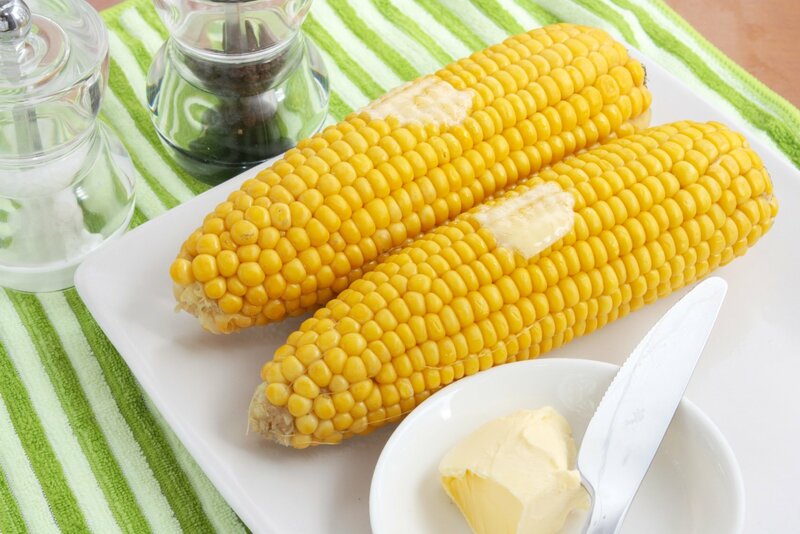 This is a delicious recipe for boiled corn on the cob. Thank you! Yes, and we still spray ‘Dibrom’ over 63,000 acres!!! Look it up. It will make you love sugar!!!!!!!!!!!!!!! I have to say, I’m simply astonished to see so many negative, condescending comments on a recipe post. I’ve come to expect such rudeness and hatred on Facebook, YouTube, and virtually every online news story with a comments section but hey, seriously? What a sad statement that makes about our society, far worse, I fear, than adding a bit of sugar to boiling water! Are that many people really that miserable and bored that they feel compelled to scour the Internet all day long seeking a forum for their “clever” put-downs, insults, and personal attacks on someone they’ve never met? Do they honestly believe they’re demonstrating superior” intellect and wit, when all they’re really accomplishing is revealing to the entire world just how small they really are? Wow. This is a site for happy, upbeat people who want to learn to live a “joyful” life via savoring the everyday, and sharing those feelings with others. Why not try to lift yourself out of that vile muck you’re wallowing in instead of trying to drag everyone else down with you? Well said Marc. I would say “superior” was not a word that came to mind for me. Here’s to sunny days and corn on the cob. You go “Doo Dah”. Many thanks. Just picked it out of the garden, used your recipe (I can never remember how long I cook it) and it was JUST right. And I am a southern woman! Along with the microwave shucking instructions, these have not have been the easiest, but best corn on the cob I’ve ever made. Several of my more Southern neighbors have told me I put “my foot” in the corn this year! High praise indeed. Thanks for a great recipe!! Tried this tonight and it was a hit for everyone!! Thanks Emily! I have to look for cooking times for corn on the cob evey year. Don’t know why I can never remember…do I put the corn in before or after the water boils?…haha your tips on the EATING protion of your post, we will try tonight : ) Thanks again! Tried it…liked it……one variation….used brown sugar…..yum yum!! The PREP SOUNDS GOOD HOWEVER,i PREFER TO EAT THE CORN ONE ROW AT A TIME USING ONLY THE TOP TEETH…WORKS GREAT FO ME. Thanks! You are wonderful. Appreciate the tip on using bottom teeth…gonna try that one. I cook corn severa ways, but did you know that you could fry fresh corn with a little hot pepper? after you take the corn off the kernel you place it in a frying pan and fry it with hot pepper and salt. We usually fight on who will eat more….. I agree with others, no sugar needed, the corn should be plenty sweet. I usually do this, drop ears of corn into COLD water in pan, turn on heat to medium high, cover. When water comes to a boil turn off the heat and remove the ears. They will be crisp and sweet, the way I like them. Nothing worse to me than a soggy ear of corn that has been in the water too long. Need to cook 3 dz ears at once. Thought boiling in electric roaster best. But how long will it take? Do I divide between two roasters? No directions in manual. You don’t need white sugar in your freaking water. Sacrilege! I wonder if adding sugar to the water adds calories. That maybe a stupid question but I don’t know. I have never heard of it but I am going to try it. thanks. I, too, had no clue how to cook corn-on-the-cob. 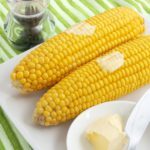 I stumbled upon this recipe a year ago, and now I constantly receive compliments on how great “my” corn-on-the-cob is. Of course, I always make sure to give credit where credit is due, and mention this website. Thanks for the sweet tip! I use half water and half milk for added taste and moisture. You’re all forgetting to add some fresh ground pepper after the butter and salt! In fact, if anything, I’d skip the salt in favor of pepper! Thanks! We can never have too many friends! This was without a doubt the best corn I have ever eaten!!! THANK YOU!!! Who knew perfect corn on the cob could be so easy, simply delicious!!! I have found that the best way to cook corn on the cob is to steam it. Same method as most above, but I just put about an inch of water in the pan, then the corn, and turn heat on high and start to time corn when the water boils.,.. About 8 minutes. It takes too long to boil a big pot of water. I use to put sugar in the water, but the corn is so sweet any more that I don’t bother now. Best. Recipe. Ever. And just in time for Memorial Day (am also using grilling suggestions posted above for my guests who like it that way). Thanks! If you’re going to grill your corn, cooking it in the husk makes the corn tast like husk. I suggest shucking the corn then sticking in salt water to brine, this will keep the corn nice and moist and then give toy those beautiful grill lines we all love so well. I put in a tablespoon of salt or so and only boil for three minutes. Turns out great every time! That’s funny. I always get teased for eating my corn on the cob like that but that’s how I have always eaten it. Everyone always remarks on how clean my cob is when I’m done. The Brown Sugar gives the barbecue sauce thickness and makes a Sweet and Tangy BBQ Sauce You’ll Love It !! Excellent – thanks for this. Hadn’t got a clue how to do this until I read this page. Twas the best corn I've ever put to mah pallette. Finally a simple corn on the cob recipe that is basically foolproof! The corn was absolutely delicious! wasn't sure if it was as basic as this, but it was. thanks for a helpful post. This is exactly the way I cooked the corn last night. After it came to a second boil with the corn in it I covered it for about 5 minutes, it was delicious. Well, I shucked my corn the night before so it would save me some time come sunday morn. Wasn't sure if I was supposed to soak it in water in the fridge or just simply place it in the fridge covered until ready to cook the next day???????? here in southeastasia, my dad buys the Japanese Sweet Corn variety. we just rinse the whole ear with tap water to remove the dust/debris. put them in a pot with water and bring to a boil and boil them for about 10 mins. then carefully shuck it (the silk usually comes off quite easily). butter and salt to taste. perfect. For 6 ears, to the water I add 1cup of sugar, 4 heaping tablespoons of salt, and 2 chicken boulion cubes. It is delicious. When cooled, I freeze the water & use it again, adding 1/2 cup of water, 2 tablespoons of salt and 1 chicken boulion cube. The same water can be frozen & doctored up several times. FYI: I am a professional Executive Chef ! Dr Jim, your “broth” idea is intriguing. Can’t wait to try it! I'm boiling the corn now. Our family will try eating it the way your father taught you– complete with “Ding”! I'm looking forward to it. Thank you! My method is similar to #13’s. Bring a pot of water to boil. Add sugar and salt to taste. Drop in fresh cobs of shucked corn. Cover pot and bring the water back to a boil. Remove from heat drain immediately. Eat and enjoy! The secret is to NOT OVERCOOK IT! I am loving reading your recipes (found you just today via the granola bar recipe). One thought. My mother-in-law taught me to boil corn the way her mother taught her, and it is so quick and has never failed. Are you ready? It’s very complicated. Put shucked corn in pot, cover with cold water, bring to a boil, and it’s done. Really. My sisters-in-law and I were a little skeptical, but she was right! It has never failed me. And I’ve been cooking it this way for 16 years. It’s never been tough, either. So long as the corn is fresh and sweet, that is. And we are lucky enough to live where the corn is fresh. You may need the sugar and other tricks for less than optimum stock, but maybe not. Try it. You might like it. Or you might not. Thanks this sounds yummy. I like shucking the corn buttering it (salt too) and wrapping each piece tightly in foil. Then I throw it in the oven at 450 degrees and bake for 25 minutes. I tried this yesterday for a birthday party cookout. I made about 20 ears, after boiling I put the ears into my Nesco roaster on warm. This was scrumptious!!!! Thank you so much for sharing! Wonderful technique! A ground misture of mont leaves,a hint of green chilli,green coriander leaves,salt and lime juice -all mixed and ground in the misxy,and brushed over the boiled corn gives a wonderful taste to it. You must adjust the green chilli as per your taste bud permits. In India, this type of eating corn is very famous. This suggestion sounds delicious! Definitely plan to try it out this weekend. I boil my corn with a bit of milk in the water–it brings out the sweetness. I use maybe 1/4 cup, if that (I just dump some in). And I add salt to the water–so I’m not adding too much to the cob at the table. Turns out so yummy! That sounds yummy and I love your pictures! My mom always puts sugar and milk in her corn water, mmmm. Everyone thinks I’m crazy when I suggest throwing in sugar so thanks for the corroboration. Mmmmmmm, you have SO put me in the mood for corn and tomatoes! I have never had it cold out of the fridge (except in corn salsa or salad, etc.) but I’ll try it. We have cooked it all kinds of ways, and my favorite is grilled. A few years ago a friend grilled it for us, just tossed on the grill (already shucked) until done, and it was great. I always assumed it needed to be in the shuck, or in foil, or buttered or marinated or something. But the easiest way turned out to be our favorite. Helena, that sounds amazing! Does your friend wrap it in tin foil or just throw it on directly? Liz, thanks so much! I didn’t serve any meat, but I guess you could! Maybe a grilled chicken breast or some homemade chicken salad would be a good match. Something not too heavy. I really like the recipes that you have shared here. The corn & tomato pie sound like a really good dinner. Do you add any kind of meat dish to it or is the dinner a vege thing? I think corn & tomato pie will be on next week’s menu. My favorite way to eat corn is grilled the way a college buddy of mine from Puerto Rico used to do it. Mix up some mayo and hot sauce (lots of hot sauce) and coat the corn with it. Grill until corn is done and all the sauce has browned–you don’t want any goopy bits on it. Before you take a bite, run a slice of fresh lime over it. Yum.